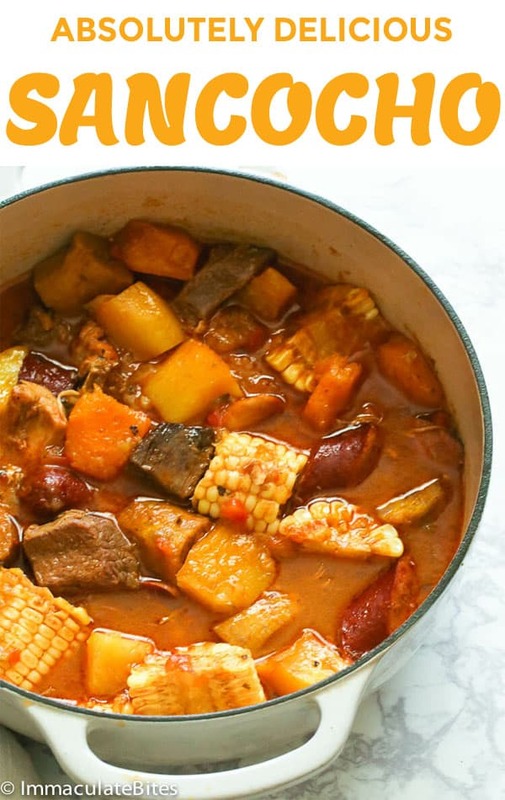 Sancocho Recipe – a hearty and absolutely delicious stew made with different kinds of meat in one pot, sausages, vegetables and starches. A very satisfying meal on its own. Perfect for this fall season! Nothing is as better as digging in on a big bowl of stew during this season. Now that it’s already October and fall is on full swing, it’s time to dust off those big pots for stews and soups. What I would usually do is make a big batch of soup and freeze any leftover for easy hearty meals anytime. And my first batch of stew for this October is this traditional dish Sancocho. 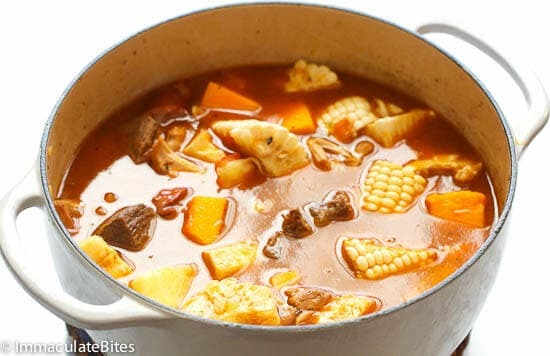 From the Spanish verb , sancochar or to parboil, Sancocho is a traditional stew popular in several Latin American countries like that of Dominican Republic, Colombia, Cuba and Puerto Rico, among others. 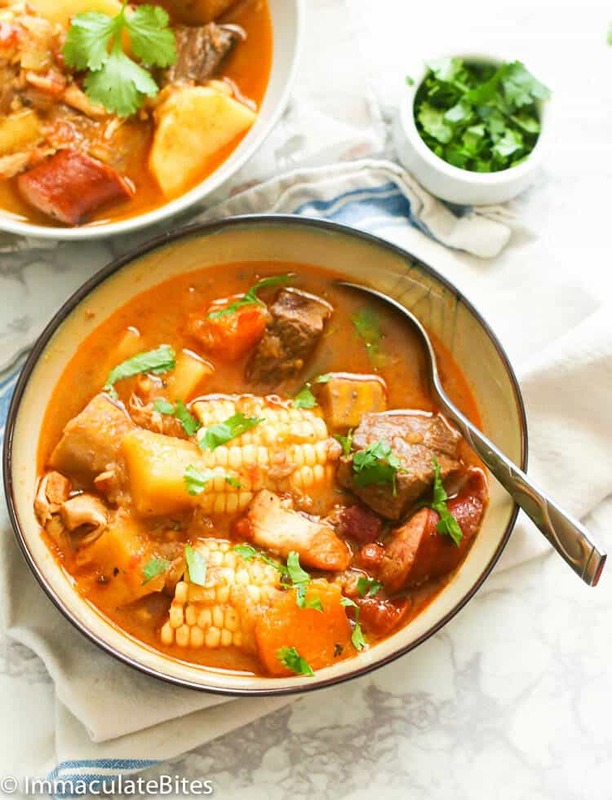 It has different variations among those countries, but the common ground is that sancocho is a hearty stew (sometimes referred as soup) made of meat,broth, starches and tubers, depending on the region. 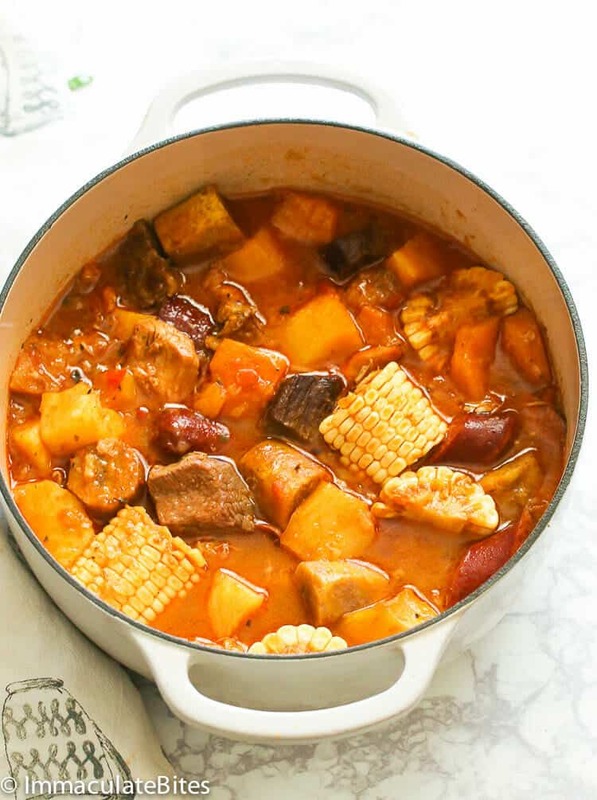 This hearty stew is often served during special occasions and the holidays. 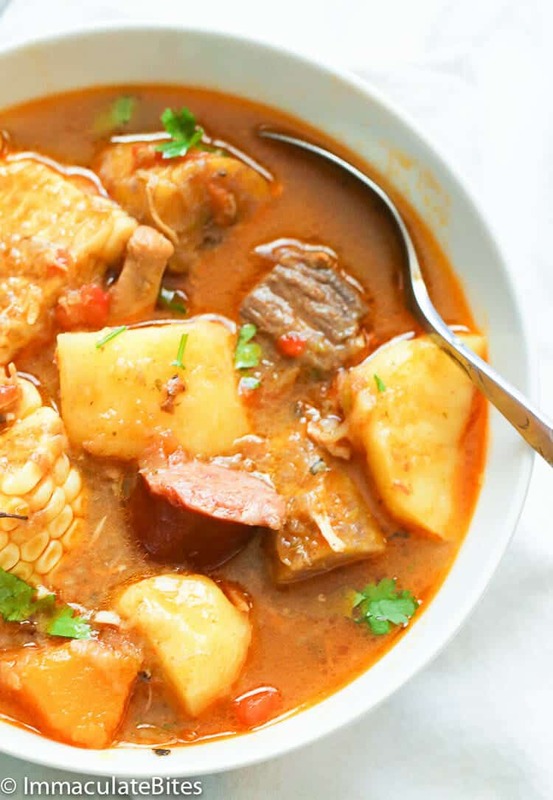 What are the ingredients in sancocho? 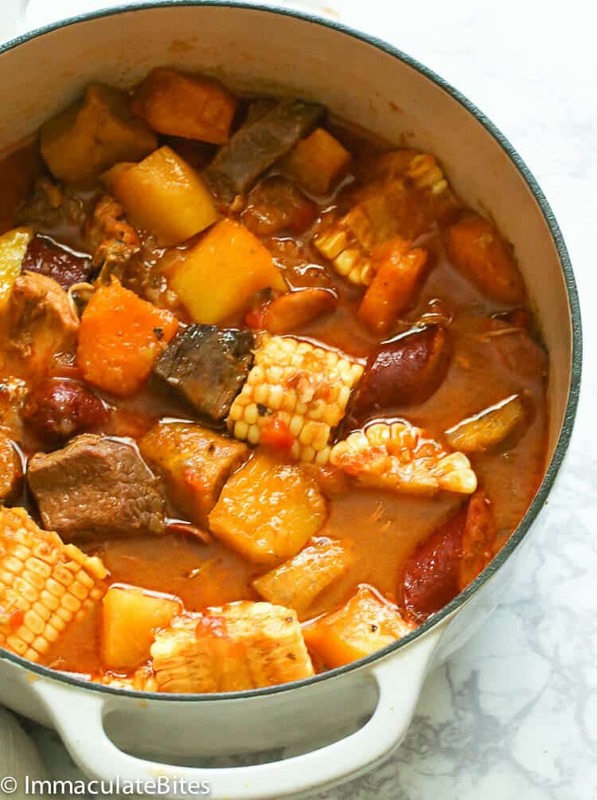 Although there are slightly different variations for this recipe, a sancocho stew often features different kinds of meat, vegetables and tubers. The meat would usually be a selection of pork, beef, chicken and fish with an addition of smoked ham or sausages. As for the starches, it would often be yucca, potatoes, carrots, pumpkin, rice and plantains. Some would even add corn on the cob in it. In the Dominican Republic, Sancocho Dominicano is considered one of the national dishes that speaks about celebrations and big milestones in life. One thing that blew me away though is that they have the traditional version of sancocho and the “ULTIMATE” sancocho which is popularly called as sancocho de siete carnes which features not just three (3) meat in one pot, but seven (7). Yes, seven!! How crazy is that!! 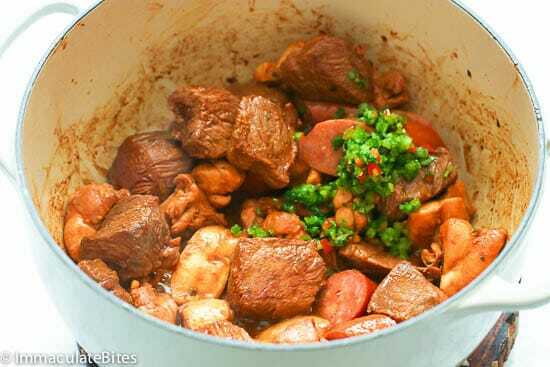 Goat meat, pork ribs, smoked ham, longganiza (a type of pork sausage) are also used in this recipe. Then, it is seasoned with some oregano, garlic, parsley or cilantro, garlic and usually with a kiss of lime juice. 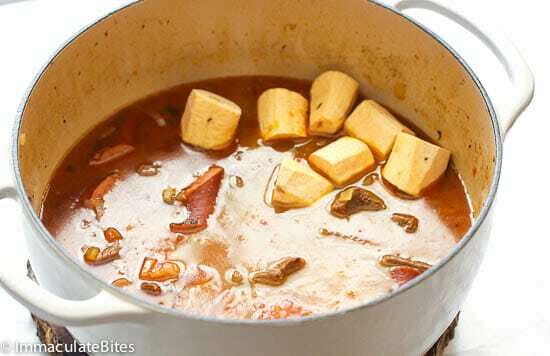 On the other hand, a Puerto Rican Sancocho closely resemble to that of the Dominican version only that it is seasoned with sazon and its popular sofrito. To those who are new to Puerto Rican cooking, a sofrito is a versatile aromatic green puree made of bell peppers, tomatoes, cilantro, garlic and onions. It makes a powerful base for dishes like stews, beans and rice. Delicious is an understatement to describe this dish! 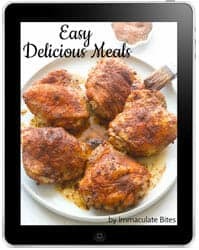 One thing to add, though, is this recipe also needs a ton of patience as it takes time to cook those meat and veggies. Just remember that you need to start cooking it from the longest-cooking to the shortest-cooking ingredient. 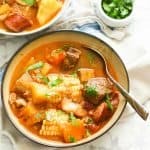 There’s no magic in here to get it all done at once, but I can assure you’ll be blown away by how hearty and flavorful this stew is. Heck, you can make it not just on Christmas, but on anytime you want. 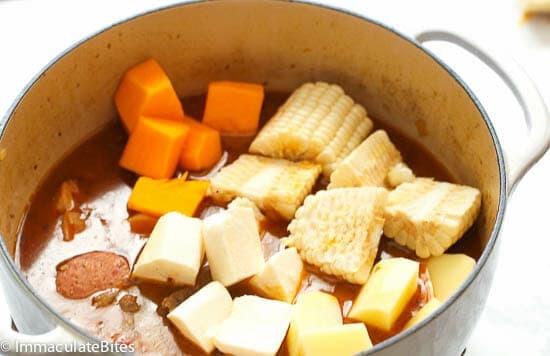 Sancocho Recipe – a hearty and absolutely delicious stew made with meat, vegetables and tubers. A very satisfying meal on its own. Perfect for this fall season! 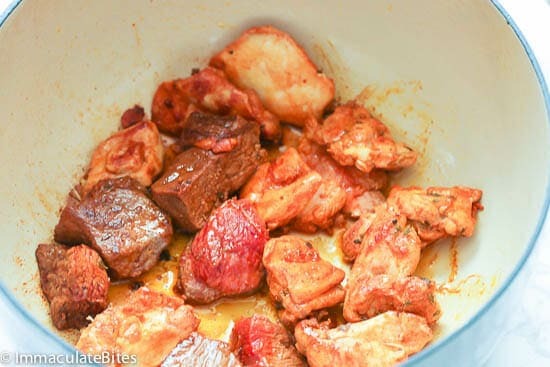 Season meat (chicken, beef both sides salt and sazon Or just use your favorite spice mix. Let sit at room temperature at least 15 minutes. 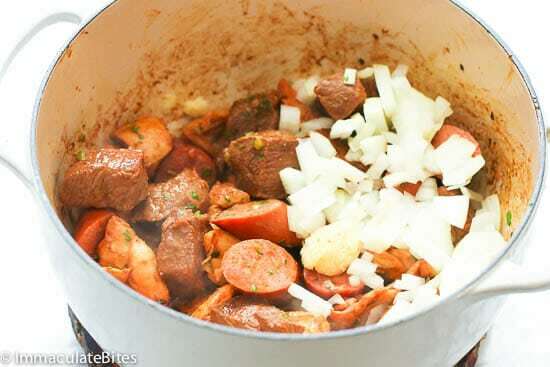 Heat up a dutch oven or Large pot over medium high heat. Add oil to the pot. Then add meat, you may do so in batches if desired, or brown the beef and chicken separately. Let it sear for about 2 minutes before turning chicken around . Cook for about 6 minutes or until brown. Add sausage and cook for another two minutes. Add sofrito, garlic, cumin, paprika, oregano and sazon. Sauté until fragrant, about a minute. Then add onions, cook for about 5 minutes. Pour in water or broth. Return meat back to the pot and bring to a boil and then lower heat, cook for about 15-20 minutes, depending on the beef. Cook less if only using chicken. Next add root vegetables – starting with the one that needs the most time to cook – in this case green plantains. Cook for about 10 minutes before adding the yucca, squash, potatoes and corn. 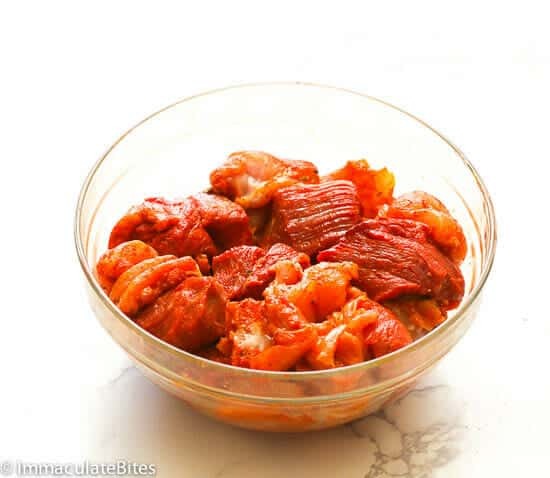 Continue cooking stew for 10 minutes until they begin to soften. Season with salt and pepper and taste for seasoning. Continue cooking until root vegetables are tender about 15-20 minutes . The stew should be thick and hearty, if not smashed a few root vegetables. Serve in large bowls, top with cilantro. Heat up a dutch oven or Large pot over medium high heat. Add oil to the pot. Then add meat, you may do so in batches if desired, or brown the beef and chicken separately. Let it sear for about 2 minutes before turning chicken around . Cook for about 6 minutes or until brown. Add sausage and cook for another two minutes. Add sofrito, garlic, cumin, paprika, oregano and sazon. Sauté until fragrant, about a minute. Then add onions, cook for about 5 minutes. Pour in water or broth. Return meat back to the pot and bring to a boil and then lower heat, cook for about 15-20 minutes, depending on the beef. Cook less if only using chicken. Next add root vegetables – starting with the one that needs the most time to cook – in this case green plantains. OMG this soup is amazing! Made my own sazon mix since it’s not available where I live so avoided MSG. I stuck as close to the original ingredients as I could. The result is great. Takes a lot of work and time to make it, but it’s really worth the effort. Thank you for posting the recipe. You’re welcome, Agnes. I’m glad it turned out great for you. This is such a hearty and comforting dish. This looks like a ‘clean out the fridge’ or ‘last-of-the-harvest’ dish. It’s not far off from the Midwest “Booyah” soup. Sazon has MSG. I prefer to avoid that.